U.N. expert Michael Sharp is shown in an undated photo from his Facebook page. For the last five years, Michael J. Sharp lived in one of the most dangerous countries in Africa, trying to broker peace between armed groups. "He was following his passion and mission to make peace in the world — a very broken and violent world," his father, John Sharp, told VOA in an interview late Thursday. That mission ended when Sharp, Swedish colleague Zahida Catalan and their interpreter, Betu Tshintela, were killed after being abducted in Kasai Central province of the Democratic Republic of the Congo earlier this month. Their bodies were found March 28 in a shallow grave next to the Moyo River. Zaida Catalan is shown in this undated photo from her Facebook page. The fate of a Congolese driver, Isaac Kabuayi, and two motorcycle drivers who were also kidnapped remains unknown. Sharp, also known as MJ, and Catalan were working as experts for the United Nations, investigating funding and weapons sources for militia groups in the DRC. Their goal was to determine whether U.N. Security Council sanctions against the groups are effective, and if they stop militias and members of the Congolese military from running illegal mines for profit. Now, John Sharp said, "We are waiting for the Congolese government to give their permission to ship the body back to the U.S." Michael Sharp's body was found intact; Catalan's was decapitated. The father believes his son's work to promote lasting stability in the troubled province should continue. "Let's let Zahida's and MJ's work continue in other hands. There's much more work to be done. Peace has not yet been negotiated," he said. A devout member of the Mennonite church — a branch of Christianity that emphasizes pacifism — Michael Sharp first went to the DRC as a volunteer with the Mennonite Central Committee, doing humanitarian work. He spoke Spanish, German and French, and was learning Swahili. "He developed his passion for peacebuilding and peacemaking in a violent world from his family, his theology, his church because Mennonites have a theology of peacebuilding and nonviolence and he seemed to take that on," his father said. 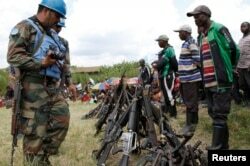 FILE - United Nations peacekeepers record details of weapons recovered from the Democratic Forces for the Liberation of Rwanda (FDLR) militants after their surrender in Kateku, a small town in eastern region of the Democratic Republic of Congo (DRC), May 30, 2014. Sharp collaborated with the Congolese Protestant Council of Churches, which was working to persuade rebel fighters to abandon violence and give up arms. His efforts were bearing fruit, with about 1,600 fighters in January 2015 laying down arms. His father said Michael Sharp was willing to expose himself to risks in order to understand the causes of conflict, and he strived to build relationships with those involved. "He was most passionate about something he initiated, I believe, and that is working to build relationships with militia group leaders, so he would travel unarmed through the forest and sit down and talk with them," his father said. Sharp also earned the admiration of prominent DRC expert Jason Stearns, director of the Congo Research Group and senior fellow at New York University. 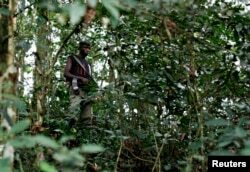 The DRC is home to dozens of small militia and rebel groups who hide out in its jungles and make a living mining the country's abundant natural resources, including copper, gold and diamonds. One of the most prominent is the Democratic Forces for the Liberation of Rwanda (FDLR), led by Rwandan Hutus fighting against what they say is a Tutsi influence in the region. FILE - Jason Stearns is the director of the Congo Research Group and senior fellow at New York University. In a blog post this week, Stearns said the FDLR is "one of the most brutal and reclusive armed groups in the region." However, that didn't deter Sharp from entering into their territory unarmed, learning about their families, listening to their pleas and "trying to gain their trust and to project empathy. Not an easy feat for a committed pacifist," Stearns wrote. Stearns said he has always been skeptical of foreigners coming in the country, but Sharp showed him that it is possible to do genuine work on behalf of the Congolese people. "I am always wary of researchers and activists who come to the Congo for adventure and self-legitimation rather than out of solidarity with the local population," he wrote. "But Michael was no such thing — he was self-effacing, devoted, and empathetic." Sharp and his colleagues went to Kasai Central in early March to investigate widespread human rights abuses near the remote village of Bunkonde, south of the provincial capital, Kananga. Violence driven by political and tribal rivalries has killed hundreds in the province since last August, and several mass graves have been found. FILE - A fighter from the FDLR rebel group stands guard deep in the bush of eastern Congo. The U.N. team disappeared March 12. The next day, the DRC government said that Sharp and Catalan had "fallen into the hands of unidentified negative forces." Quickly, the U.N. mission in Congo, MONUSCO, began a search-and-rescue effort that ended Wednesday with the discovery of the bodies. The eastern DRC has been plagued with violence since the mid-1990s, with millions killed and more than 2 million displaced in what is sometimes called Africa's World War. Much of the country remains beyond the reach of the central government and is controlled by militia groups. Sharp's father wants to see Congo's perpetual conflict brought to an end, and thinks the loss of his son could trigger more attention to the cause of the conflict. He urged the U.N. not to give up on its mission, and said more experts are needed to monitor sanctions and bring justice to the area. "As my son said, nothing is acceptable until there is true peace and complete peace," John Sharp said. "Congolese people deserve peace, they deserve to live in harmony with their neighbors and we should make all efforts possible to make that happen and to stop believing in the myth of redemptive violence."